Screening is the process of testing to verify that your pet is healthy enough to donate blood that is able to be used for other pets. After you have called ahead and arrived for your screening (or if you have signed up for and are attending one of our blood drives) your pet will be weighed and you will need to complete an information form for you and your pet. 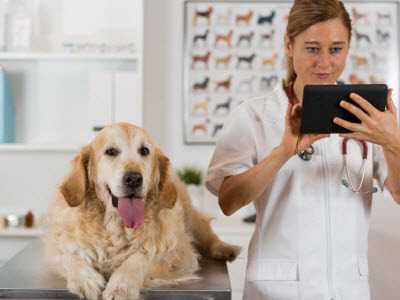 A veterinary technician will acquire a brief health history from you and obtain basic vital measurements for your pet. Soon after, one of our veterinarians will perform a complete physical on your pet. For dogs, blood will be drawn and divided into three samples for tests to determine the current health status of your pet: the first sample will be sent to an outside lab to determine your dog's blood type and see if your pet qualifies as a "universal blood donor". Only 1 dog in 15 is a universal donor! If your dog is a universal donor, a general health profile and complete blood count will be performed by AEC using the second blood sample. The third blood sample will then be sent to another external lab to specifically screen for any tick born diseases. Within 2 weeks, complete screening results will be mailed to you, and if your dog is eligible to become a donor they will be placed on our calling list and will then be able to donate when we need them! For cats, blood will be drawn and also divided into three samples. The first sample is used in-house for blood typing. The second sample is used for feline leukemia and FIV testing, and the third sample is for a general health profile and complete blood count. All testing for cats is done immediately in-house. Eligible donors who wish to remain in the program will receive an exam and have their blood work tested annually at AEC's expense.